Aston Clinton manager Jordan King said he took “many positives” from his team’s impressive performance against title-chasing Kent Athletic despite losing the game 2-1. Kent are yet to taste defeat this season, winning 11 of their 12 matches prior to Saturday, however they were fortunate not to be beaten by Aston. The visitors created a number of chances but found themselves 1-0 down at half-time before Giorgio Magnocavallo, Lewis Workman and Alex Smith all had good opportunities to equalise in the second half. 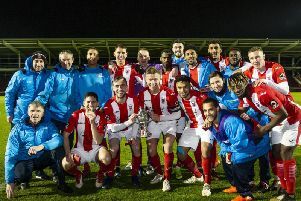 Aston’s failure to convert was costly, though, as Kent went down the other end and doubled their lead and although Luke Woodward’s goal set up a tense final 15 minutes, Athletic withstood some heavy pressure to see out the win. King said afterwards: “What a performance from us today, so many positives to take away. “We came to one of the top sides in the league and were the better team and so unfortunate to come away with nothing. “We need to be a bit more clinical and ruthless in front of goal but apart from that the lads were brilliant. Aston Clinton, who are 14th in SSML Division Two, travel to Stony Stratford this Saturday.